While living in Big Bear Lake in my early 20s, I hiked nearly every trail crisscrossing Southern California’s San Bernardino Mountains with my friend, Trish. At the time, she and her husband were fresh transplants from the East Coast and who had purchased a bed and breakfast in Big Bear. I had recently moved from the Midwest and was keen on exploring my new alpine home every chance I could. After her guests would check out on weekends, she and I would pick a trail and set off with her dogs through the pines and the fresh mountain air. We talked about everything on our hikes. When I moved away a few years later, our hikes and talks were the things I missed most. We kept in touch over the years as we moved onto different cities, different jobs, and different phases in our lives. And then last spring, I found out I had the opportunity to return to Southern California and visit another mountain town: Idyllwild. Inexplicably, neither Trish nor I had ever been to Idyllwild. 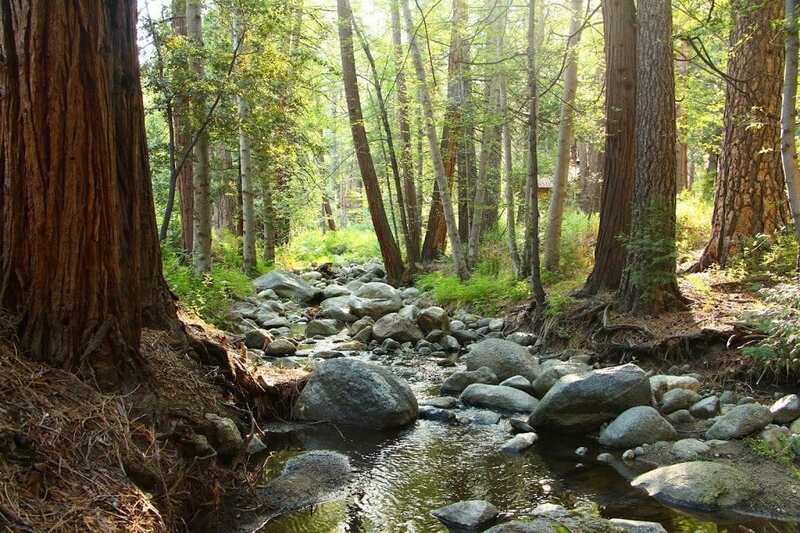 It’s located south of Big Bear, in the San Jacinto Mountains, closer to Palm Springs, but still just two hours from either Los Angeles or San Diego. 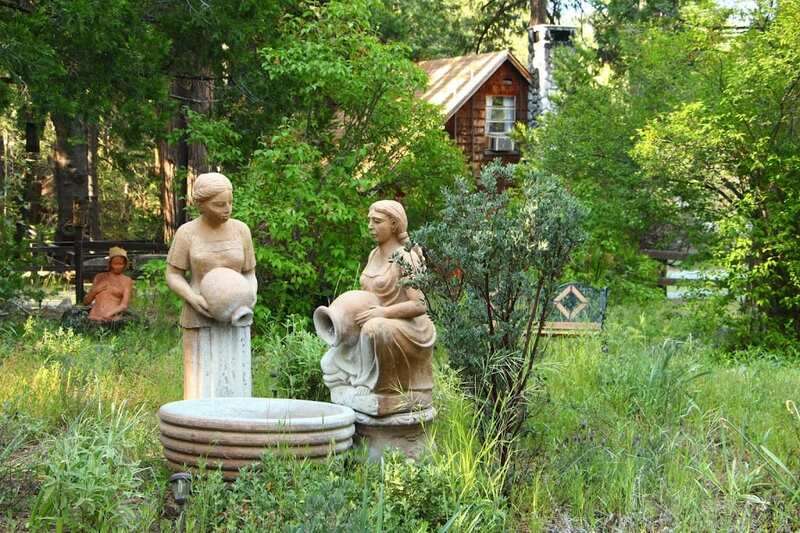 While living in Big Bear, Trish and I had both thought of Idyllwild as the more artsy, sophisticated distant cousin to Big Bear. Idyllwild had a summer music festival and a jazz festival. Big Bear had Oktoberfest. When I told Trish I was headed to Idyllwild, she enthusiastically agreed to join me. Leaving the traffic-choked I-10 freeway, I zipped up the winding mountain highway in my rental car, into the pines and clear blue skies. The landscape was at once familiar and different. Mountain ridgelines were covered in pines, but here they seemed closer, steeper, and more rugged than what I remembered from Big Bear. I arrived in the village of Idyllwild to find a charming collection of wood-shingled buildings housing art galleries, shops, and cafes. I immediately spotted Trish’s bright red Prius parked outside of an antique store. We wandered through town, got our bearings and some coffee, and then headed to nearby Idyllwild County Park to hike. On the suggestion of a local, we pieced together a longer loop hike by combining several trails within the park. From the parking lot trailhead, we climbed steeply through wildflowers and blooming manzanita along Perimeter Trail to some incredible vistas of the granite rock-outcroppings rising above town. Climbing further up, past the nature center, we hiked along Summit Trail lined with large boulders. We eventually dropped back down along a shady creek and a meadow paralleling the campground. It was refreshing to be back in the mountains and rehashing life with a dear friend. We arrived back at the parking lot spent from the hike and seriously hungry. I was staying the night at Strawberry Creek Inn near the village. We were greeted by Rodney Williams, who was an amiable host with a soft-spoken, low-key vibe. He gave us a quick tour of the inn and pointed out the trail along Strawberry Creek leading to the village, where we planned to have dinner at Ferro. The inn’s main house—a large, wood-shingled cabin–was built as private residence in 1946. In the 1970s, the house was turned into a restaurant, and then opened as a bed and breakfast in the mid-1980s. Rodney and his partner Ian Scott purchased the B&B in 2004, fulfilling their dream of owning a B&B in a small town surrounded by nature. The rustic, charming inn includes five rooms in the main house, a row of four courtyard-facing rooms along the back, and a charming cottage overlooking the creek. Each of the courtyard rooms is decorated in a different theme, tastefully blending textures, colors, and other elements. My room, the Country Gentleman, was a bit like sneaking into the cozy study of a well-educated, well-traveled grandfather. An antique Smith-Corona typewriter sat on table near the door. A framed papyrus painting from Egypt and large gilded mirror hung on the dark, wood-paneled walls. The tin-stamped ceiling reflected the warm glow of the mission-style mica lamps and a flickering chandelier. 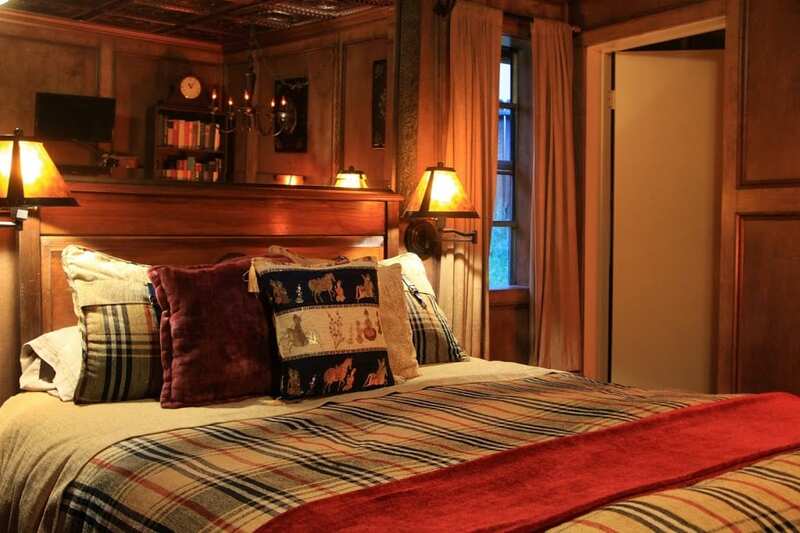 The comfortable bed with a beautifully hand-carved wooden headboard was furnished with a Burberry-esque plaid duvet cover, a pile of coordinating pillows, smooth sheets, and a red chenille blanket at the foot of the bed. Across from the bed, bookshelves filled with a thoughtful selection of antique books lined either side of the brick fireplace with an electric insert. A pair of binoculars and glass sherry decanters stood on the wooden mantel. A leather armchair sat in the corner beside a chess table. Beneath the chess table, I found microscope and a magnifying glass. The room also had a small refrigerator, coffeemaker, and DirectTV. The room opened to a courtyard with comfortable outdoor seating. 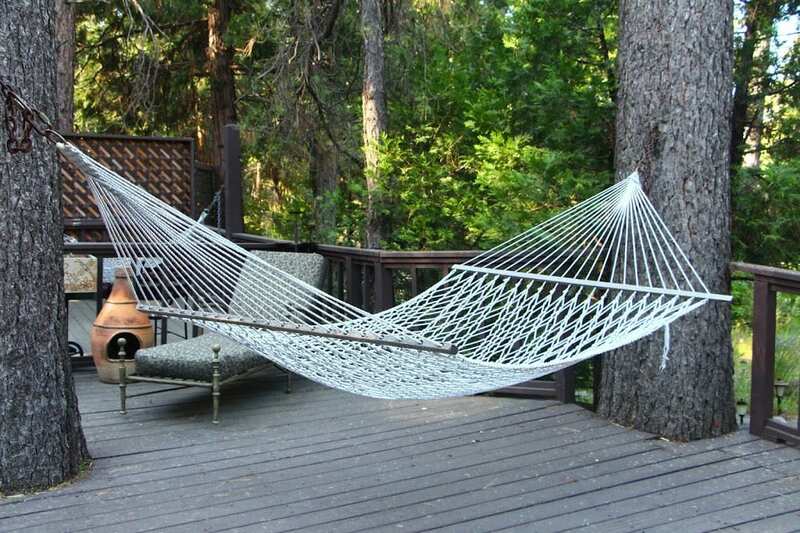 The inn sits just off the highway on over an acre of a certified wildlife habitat with extensive gardens and hammocks for lounging beneath the pines. There’s also a gazebo and more outdoor seating overlooking the creek. 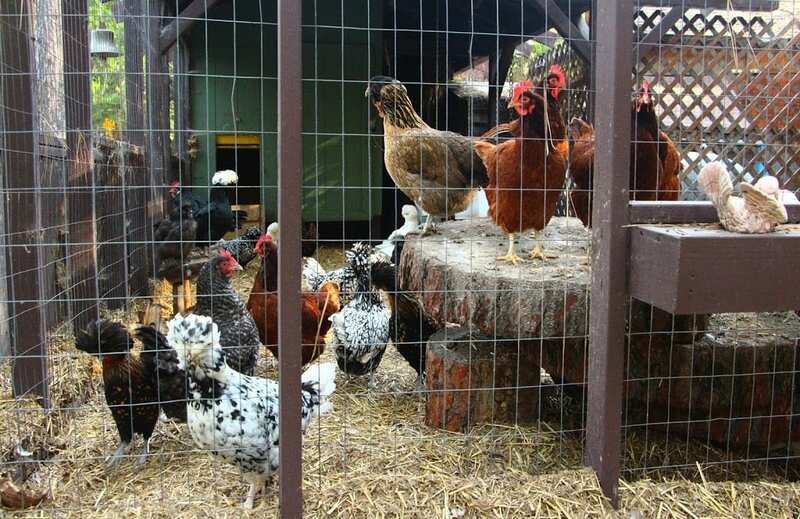 A chicken coop with an assortment of hens—Polish Crested, Ameraucana, Copper Marans, and Rhode Island Reds—provides entertainment for the guests and eggs for breakfast. Just before Trish and I left for dinner, we stood giggling at the chickens and snapping their pictures. From the gazebo, a trail leads down to the trickling waters of Strawberry Creek. We followed the path in the dappled sunlight beneath the tall pines and cedars along the boulder-strewn creek. In town, we had dinner at Ferro, a modern Italian osteria with a romantic ambiance. We sat outdoors on the back patio in the fading light and worked our way through several delicious courses and glasses of wine. Breakfast was served the next morning on the glassed-in veranda of the main house of the inn. 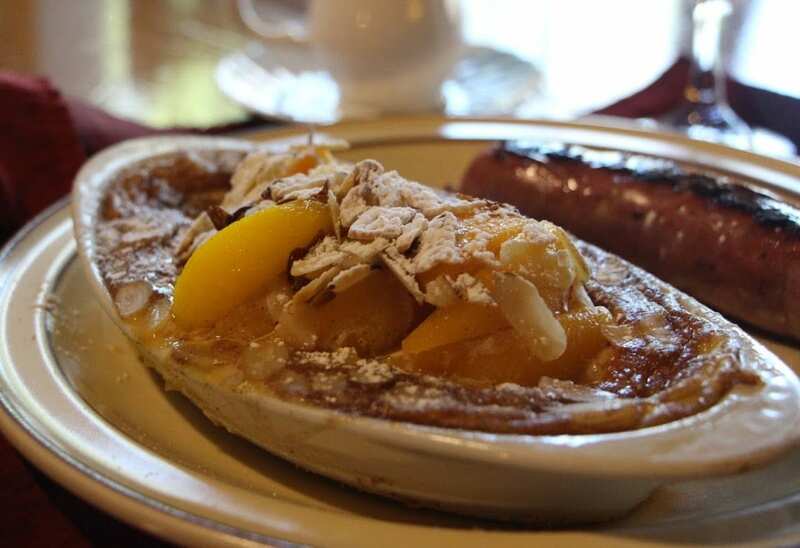 It was a delightful treat: baked French toast topped with caramelized peaches, silvered almonds, powdered sugar, and warm maple syrup served with a side of chicken apple sausage. The recipe for the French toast appears in the cookbook, Memorable Mornings from the Strawberry Creek Inn. 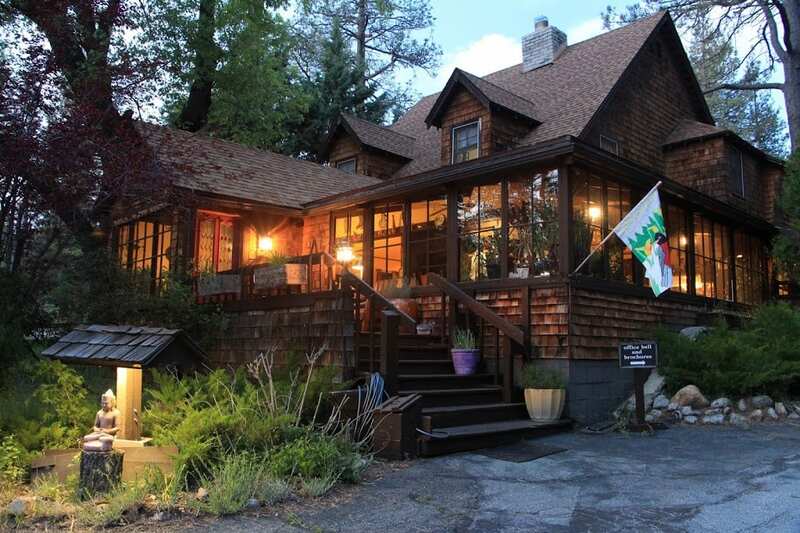 While in Idyllwild, I also visited the Quiet Creek Inn. It’s located just a mile and a half from the heart of the village, but feels like it’s a world away. 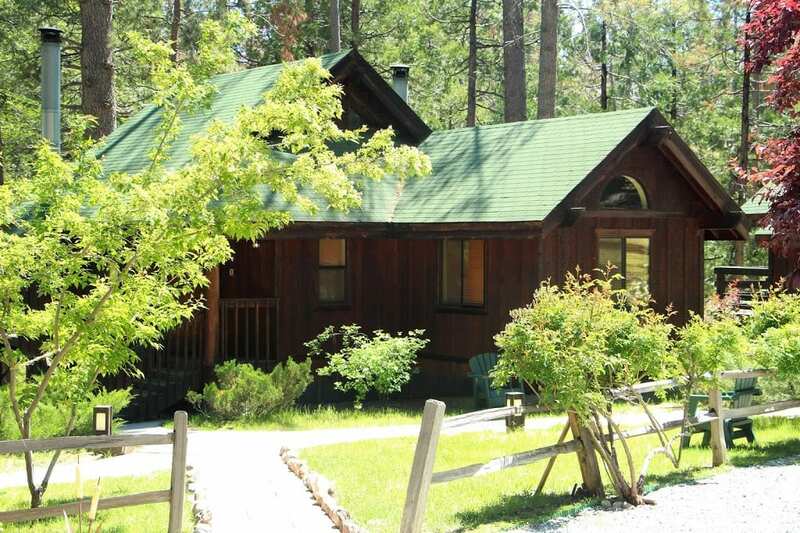 The inn is a collection of 10 woodsy cottages on seven acres along Strawberry Creek. The property is also a certified wildlife habitat with towering pines, cedars, oaks, Japanese maples, lilacs, juniper, and wild roses. Natural wildlife includes squirrels, rabbits, coyotes, bobcats, mule deer and a variety of birds. With two hammocks strung beneath the trees and countless pairs of Adirondack chairs spread out along the edge of the creek, it’s an idyllic place to unwind and get lost in nature. A mile-long path along the creek extends from the inn to a Boy Scout camp. 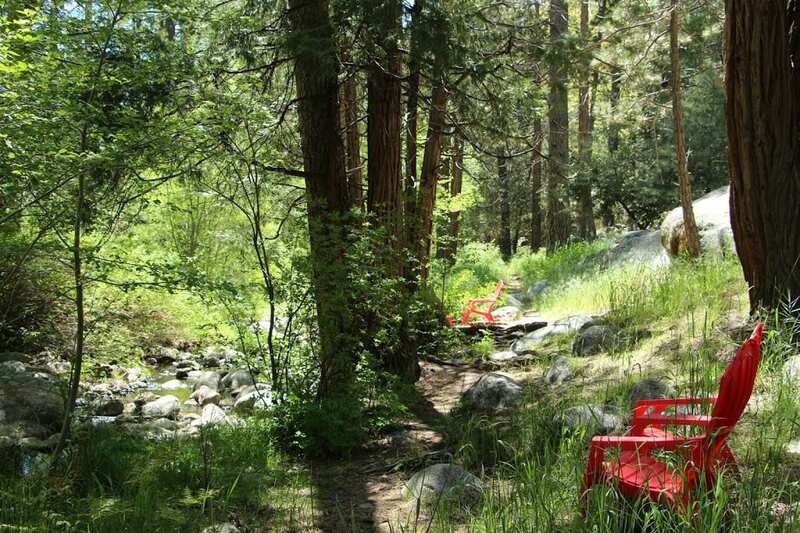 Just a few blocks from the inn, guests can access the western reaches of the hiking trails in Idyllwild County Park, which can connect them to the village, the nature center, or more challenging climbs into the high country via the Deer Springs Trailhead. Quiet Creek Inn’s property was once a horse ranch. The original barn was converted into a guest lounge outfitted with games, books, and a piano. Just outside the barn, guests can try their hand at throwing horseshoes at the horseshoe pit. The guest cabins were built in the late 1980s to resemble the historic rustic cabins of the 1940s, but with modern plumbing and amenities. 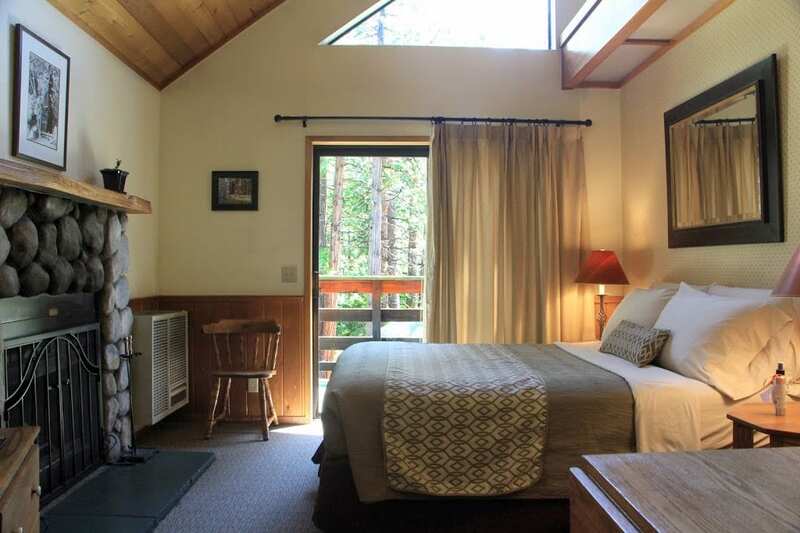 Each of the 10 cabins have vaulted ceilings with clerestory windows, wood-burning fireplaces built from river rock, and sliding glass doors that open to private decks overlooking the creek. 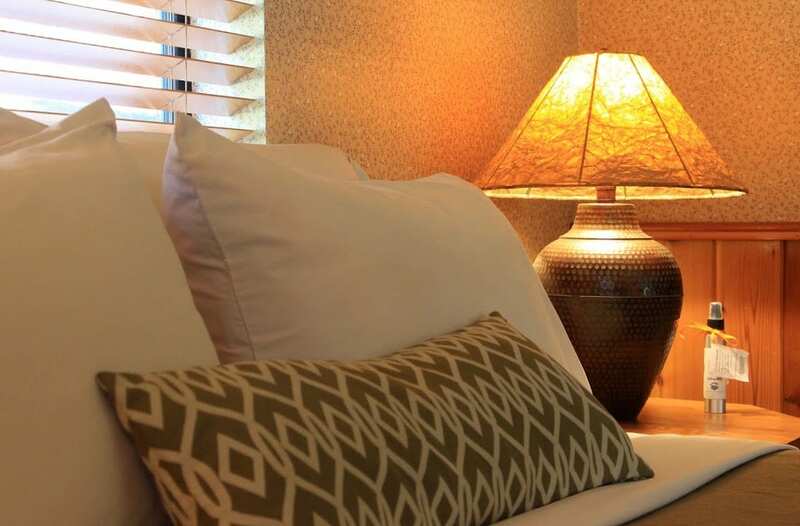 Each of the one-bedroom suite and studio cabins are also equipped with WiFi, HDTV with complimentary on-demand movies and shows, coffee makers, small refrigerators, microwaves, glassware, dishes, utensils, and basic kitchen implements. The one-bedroom suites feature king or queen beds, kitchenettes with two-burner stoves and sinks, and queen-size sofa sleepers in the living room. The premium king suite offers an expanded private deck with air conditioning and the best views of the creek. 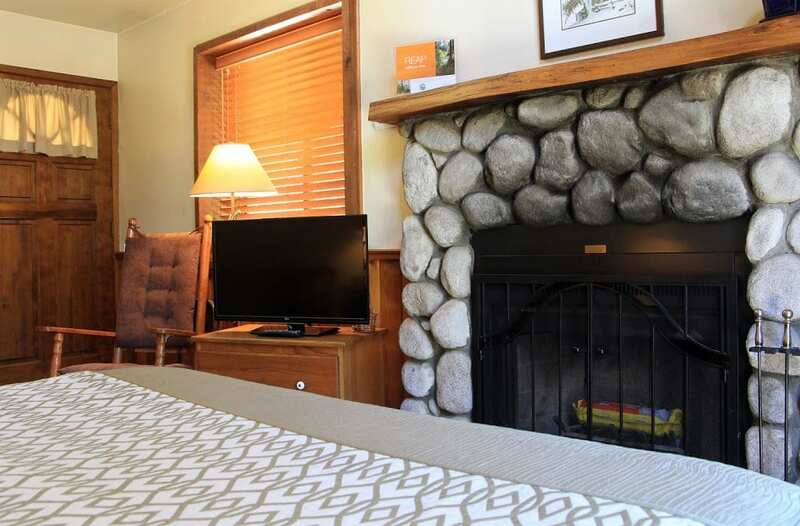 Innkeepers Marc Kassouf and Nathan DePetris took over management in 2013 and have been making upgrades ever since. In the first six months, they replaced all of the bedding and linens. The new linens include smooth white sheets, sage green duvet covers with a silky texture resembling rippling water, modern-patterned accent pieces, and premium cotton towels. They also upgraded other amenities and began a series of landscaping projects to transform the grounds. In the next six months, they renovated the cabins with new flooring and paint. 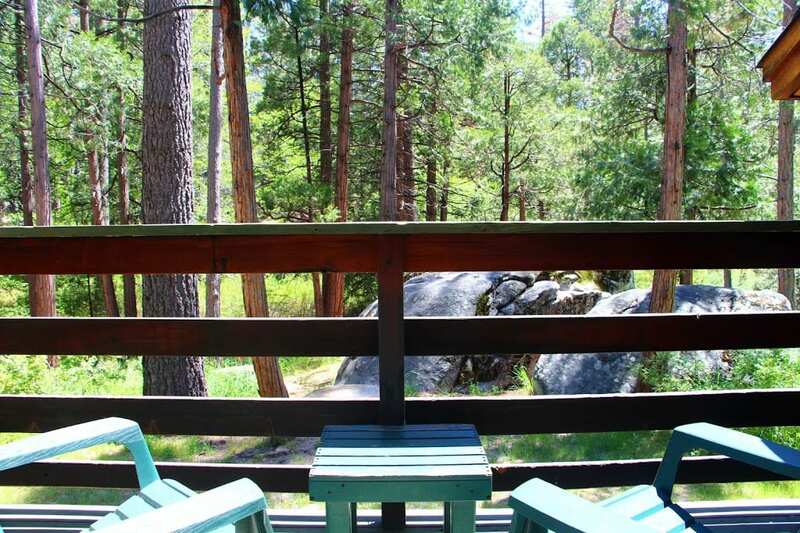 They sanded and re-oiled the exteriors of all of the cabins to bring back the deep honey-hued color and sealed the decking with a green stain. They also brought in new beds for all of the cabins and luxury sleeper sofas for all of the suites. A few moments later, I noticed a gray squirrel peering in from the deck railing. He was framed in the window against a beautiful backdrop of pine trees, boulders, and the creek… just hanging out in a mountain wonderland waiting for his next meal.